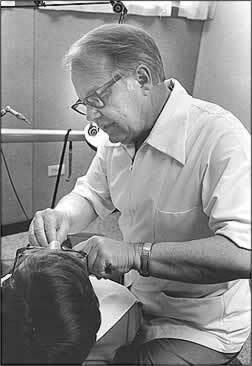 One of the speakers at the first annual Society Gathering, on October 12, 2007, was Dr. Jack Hunt, who was Cliffside’s dentist for many years. Here’s the transcript of his talk. Reno would argue with that. Anyway we did ramble around a lot. I can ramble all night, but I won’t, but I thought you might get someone else up here to help me a little bit and to answer questions about Cliffside that are hard to explain. Hope you all can help me a little later. I am not a Shakespearean scholar, but he did say, “All’s well that ends well.” And I thought we’d turn this around a little bit, into “All’s well that begins well. So I went over the next morning and told Dr. Robertson again about my plans to go to Shelby in two months. The office was full and he immediately opened the door and said, “This is Dr. Hunt and he is coming to take my place.” And this was before we got it all agreed to, but anyhow we did. To show you his generosity, he said, “This is Ruth, my wife. She is not going with me. She is not a good chair-side assistant, but she can handle the phone and appointments and that sort of thing. And you don’t have to pay her. You can have everything you make, I don’t want any of it.” So that was pretty exciting. So I decided I would come and stay for two month until I went to Shelby. I got home and Dad said, “Well, Son, did you see Maurice Hendrick?” And I said, “Who is he?” And he said, “He is boss over there in Cliffside. He succeeded Mr. Charlie. You need to go talk to him.” And I said, “Why?” “You don’t understand Cliffside,” he said. Anyhow, I went over to see Mr. Hendrick and I was intimidated. He was [in his office] above the fish pond, over there behind a big old desk, an imposing person with black horn rim glasses . We talked and I told him my plan and, if it was OK, I was going to stay only a couple of months and then I was going to Shelby. “I hope that’s alright,” I said, and he said, “Yes, that will be fine. People here need dental care and Dr. Robertson has been in and out all during the war. They need some health care and they will be tickled. And when you leave it will be no problem.” I got to the door and he said one other thing. He looked down over those horn rim glasses and said, “I just want to say the people here in Cliffside today [also] came to stay two or three months.” Well, I didn’t think about that until 40 years later I thought about it a lot. He loved that story and liked to tell that story. When I did get here [Mr. Hendrick] told me that there were 451—I remember this number —heads of households in Cliffside. My calculations were that there was 3,000 people in the village, each head of household had a wife and two or three children, so my guess was 3,000. After I was here awhile I fell in love with the people in the community and I wondered, and have thought about it a lot since, why Cliffside is so unique and why people have such a warm feeling for it. First, Ruby and I lived in a little room with Mrs. Robertson. We ended up living on Stimson Street, across from the grave yard. Coach Dorus Huss and his two daughters were on one side of us, and Jimmy and Ferne Padgett and their beautiful daughter Virginia lived on the other side. We enjoyed that beautiful area a long time. You know when I was practicing it was a different era. My office was low key. People would come in sit down on the stool with their wife or child. Another unique thing was, I never sent out any statements. It was unique, and I don’t think any of my dentist colleagues could say that. One reason was most people paid their one dollar, two dollars or three dollars or whatever the bill was when they left. Of course some people would pay a dollar a week or that sort of thing. But anyhow, that is how my practice was different from my friends’ practices. After awhile I got up enough courage to back into that place myself. Almost everybody from Cliffside snuck around to see Dr. Broom. So anyhow we loved living here. We had a lot of opportunities to do other things and always ended up Cliffside kept calling. We lived in 8 locations in our lifetime and everyone we loved as much as Cliffside. A two-bedroom house, one bath, four of our five daughters grew up there, and we were happy as larks. We learned a lot, had a lot of lessons in Cliffside. So if any of you have a library and keep a few books, that’s the only way to keep them as they will get away from you. I learned that lesson from Mr. Charlie. I learned about service from a lady in Cliffside, and I saw her daughter here a little while ago. Our number two little girl, Penny, when she was about three years old, was always talking about “Mrs. Lord.” We didn’t know what she was saying about. She kept saying, “Mrs. Lord…I saw Mrs. Lord today.” So one day we saw this lady, and Penny said, “Hey, Mrs. Lord…there is Mrs. Lord…hey, Mrs. Lord.” The lady was Mrs. Herman Norville. Mrs. Norville kept the nursery at the church and Penny thought that, since she was always in the church, Mrs. Norville was the Lord’s wife. When I reminisce, I think of a lot of people. Winky Pearson, anybody remember Winky? He was always involved in baseball and kids, and so forth, as, of course, a lot of others were, too. And I remember bird hunting with Hal Miller and Grover Jenkins. One of the things I remember was how really and truly smart the people in Cliffside were, with brains, you know. I didn’t come over here expecting that, to be very candid. That was something I learned quickly. The smartest people I have been around before or since came from Cliffside. You know Don [Bailey] is one example, and there are many, many others, such as Reginald Harris, who ended up as President of the American Society of Internists. I remember rabbit hunting with John Harris. John had a bunch of dogs. You know there no dogs in Cliffside but hunters kept them close by. John always had some beagles. Soon after I moved here, we went over to my farm with what must have been 25 men, 25 children and 25 beagles and we were having some real rabbit hunting. Somebody cooked the stew and we had a lot of fun. I learned a little about politics from Lassie and Gotha Humphries. Everybody, with the exception of P.D. Causby and Fred Robison, were democrats and nearly everybody had a picture of FDR on a wall in their house. In Cliffside, when you got out of line a little bit, someone was sure to kid you about it. I remember Hicky Wortman telling me one day (about what I was doing wrong or hadn’t done), “You better behave or we will send you to Hen-retter [Henrietta].” Now, that was a community pride. How do you get hooked on Cliffside. It is unique. Is it the closeness of the neighbor, clannishness, pride, or big families, or osmosis or heredity? It does take a village to raise a child. Everybody here remembers that. The village helped raise you. So why are you hooked? You are or you wouldn’t be here. So what hooked you on Cliffside? I thought about this many times and [I’ve settled on] one word—there are many words but the one word is love. And God is Love.